When cooking beef, the opposite rules apply to slow cooker crock pot cooking as opposed to oven roasting. Cheap cuts are better in this case The slow 6-8 hour slow cooker/crockpot cooking breaks down the muscle in just about anything, consequently a reasonably lean inexpensive cut of meat is the best choice so you don’t end up with bits and pieces when it’s done. A cut like prime rib would end up being hash in a crock pot whereas top or bottom round will hold together and be tender. 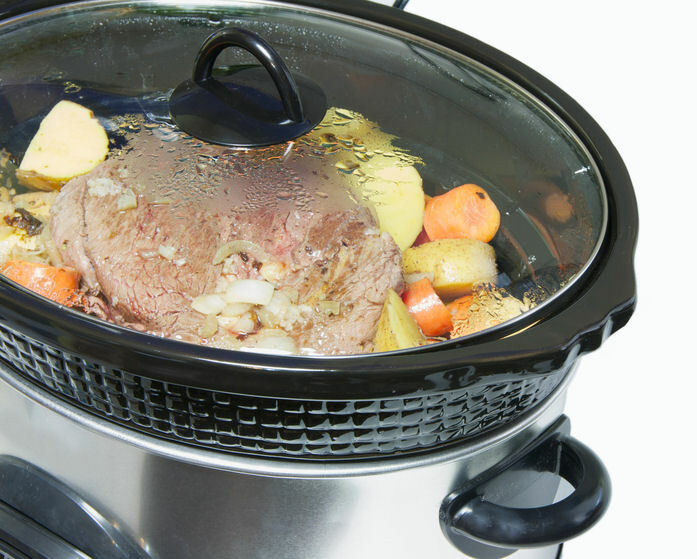 This slow cooker crock pot recipe for roast beef and vegetable is hearty and delicious. Seasoned with onions, celery and garlic, and with potatoes and carrots in just enough water to barely cover the veggies, the meat will create more liquid as it cooks down. The fact that the covered slow cooker crock pot keeps moisture in, will allow the meat to make its own gravy. Don’t add noodles or rice, or thicken the liquid until the last hour of cooking or you’ll end up with mush. In reality, the cooking method in a slow cooker is essentially the same as the conventional way of cooking pot roast — braising — and the slow process makes an otherwise tough piece of meat quite delicious. Moist and juicy, a slow cooker pot roast is an economical one pot meal great for chilly fall and winter days. Place roast in a hot cast iron skillet and brown on all sides. Place onion and celery on the bottom of crockpot. Next layer the carrots on top of onion/celery layer. Set roast on to of carrot layer. Place potatoes around the roast. Pour 3 tablespoons of Worcestershire sauce on the roast. Place chopped garlic, 1 tsp. of coarse salt, and 1/2tsp. of pepper on top of roast. Pour 2 ½ cups of beef broth on the potatoes. Cover and cook on slow for 8 hours or high for 5 hours. When cooked, carefully remove roast and vegetables from slow cooker. Use juices to make a gravy. We party at Savvy Southern Style – join us! Wow…I can’t wait to try this recipe. Thanks for the tidbit on the choice of meat to purchase. It’s almost 5 a.m. and this has made me hungry. I tried to email the recipe but it wouldn’t let me. Also, why can I not save it? You should be able to save it, but everyone’s computer is a little different dependent on the soft ware installed. Try this. In the upper right corner of the recipe you will see the word “Print”. Click on that and you can print out the recipe. If you don’t have a printer, try highlighting this “Print” recipe, right click and “copy” it. Then “paste” it into a word processing program like Microsoft Word. You can then save it. Thanks for all of the awesome tips and the yummy recipe. Thanks for sharing on the weekend re-Treat Link Party! Hope to see you again tomorrow. Do you really cook the beef roast for 8 hours on HIGH? HIGH for 5-6 hours – LOW for 8 hours. I didn’t think of that regarding the cut of the meat. I always buy cheap just because that’s what I need to do…but now I don’t feel so bad! Ha! 🙂 Thanks for linking up! Crock pot cooking is the only way I cook a roast anymore. I pretty much do the same thing, but I don’t braise mine first. Maybe I’ll try it next time and see if I can tell any difference. Thanks for sharing with Share Your Cup. I’m sure it wasn’t intentional, but I do not see a link back. 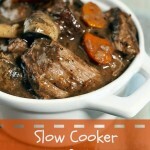 Slow cooker recipes are always a favorite with me. Thanks for sharing. Looks delicious! One of my families favorite meals and when I worked I used the crock pot a lot. It was a life saver as I had an hour commute each way. Thanks for sharing at Transformed Tuesday. Thanks for sharing your cool idea with us! Stop by again next week and link up another cool idea. Nothing better than a meal from the slow cooker! Thanks for bringing this to the Oldie’s party! Hope to see you back there next week. Beef, potatoes, carrots and a slow cooker — what could be better! It’s that time of year when a meal like pot roast is oh so comforting! You can slow cook in your dutch oven in your oven, rather than a stove top! Just an idea! Mmmmmm . . . this is one of my favorite things to cook at this time of the year. We JUST had this last night for dinner. It’s one of our go to meals in the winter. Thanks for sharing at MTM. The nice thing with a crock pot is that you can use it in the summer without heating up your kitchen so I use it all year round. I even use it to bake bread. I just love crockpot recipes so appreciate yours! This looks very good! Sheryl your recipe looks wonderful and you know I realized our recipes are very similar however I don’t use worsterchire sauce so the next time I make mine I am going to add that because your version sounds so delicious! YUM! Thanks so much for linking up this week to “The Ole Saturday Homesteading Trading Post” blog hop! Hope you join us again next week! I love Worcestershire Sauce with Beef. I use it in flavoring meatloaf and I even use it when I make hamburger patties for grilling!